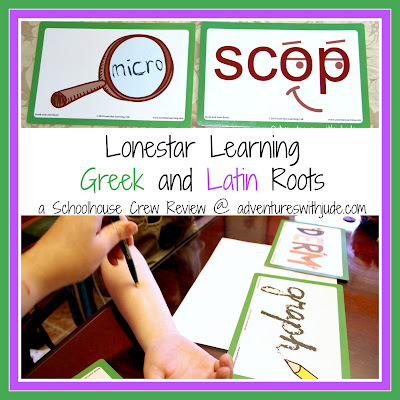 We recently had a fun time working with Lone Star Learning's Greek and Latin Roots cards. They are a set of oversized flashcards (measuring almost 6" x 8") with pictograms of common Greek and Latin-derived vocabulary bases. 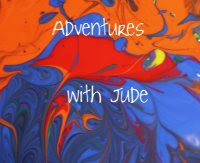 They are intended for students in grades 3 through 7. This meant Matthew and Celia were "officially" part of the review team this round, but Luke (grade 9) also found them helpful. Homographs are words that are written the same, but pronounced differently or have different meanings. Some examples she listed were read (/reed/ and /red/) and bear (the animal and the verb "to carry"). Celia was surprised at first to learn that the roots help with Language Arts words too. The visuals on the cards also helped her understand terms she had heard elsewhere. For example, the allergist has said she (and her brothers) have dermatographic skin. Now that she knew "graph" meant "writing," she could determine that dermatographic meant "something doctor-speak about writing." Well, sort of. We put the cards together to form the word. She figured out from the picture that "derm" meant "skin." At first, she guessed it meant "writing with skin," so then I showed her the diagnostic process. A pointless pen (or other blunt object) is scraped across the skin and if the skin is dermatographic there will usually be a raised welt. (Celia's is very mild, so demonstrating was not harmful to her. Some patients with this can be itchy when scratched, but she often welts from daily activities without any itch.) She was impressed to find out what it exactly was, and excited to now know what the doctor was talking about. helped him understand it was a tool used to look at little things. He then was able to deduce scope in context - to "scope out" a situation meant to look and see what is going on. At this point, Celia decided to interrupt and ask what exactly was the doctor looking at when she had a "scope" done at the hospital. I explained that the procedure is actually called an endoscopy, and endo means "inside." 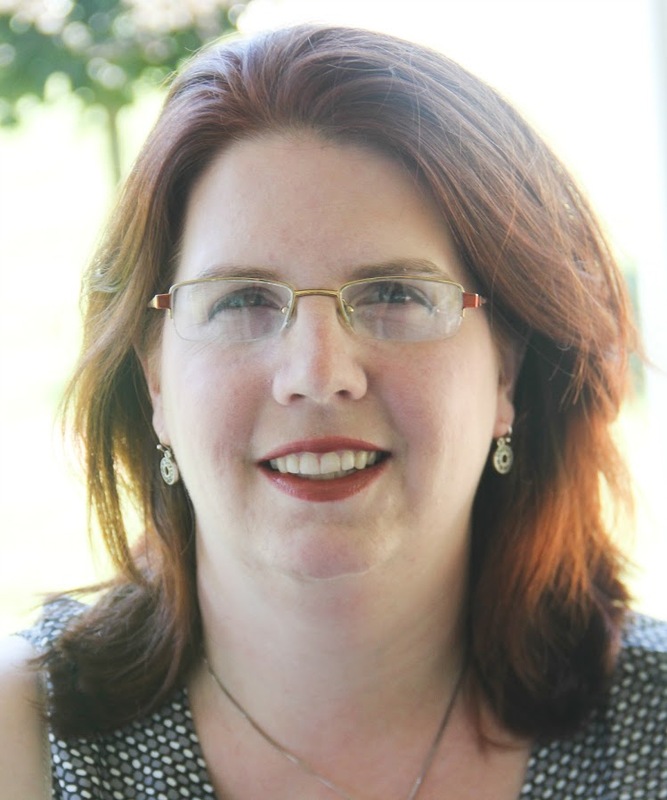 She then figured out that that an "endoscopy" looked at her insides -- specifically inside her stomach and esophagus. Celia mainly focused on the Greek root cards. She found the Latin ones more difficult because they were harder to combine into just-roots words. For example, the study of teeth is "dentistry," not "dentology." I think this difficulty is because she is just beginning to make the transition from phonics-based spelling and vocabulary lists to definition-driven word groupings. Matthew, however, has word groups assigned that are based on meanings. He found these cards helpful to explain things to him; for example, prim means "first." He has learned that a prime number is only divisible by itself and one; the Prime Meridian is 0° Longitude and divides the Eastern and Western Hemispheres. However, seeing the "I" in on the card written as "1st" helped to cement the concept. Another compound word that we broke down using the cards is hemisphere. Sphere is Greek and means "ball" or "globe." He was able to deduce that if the Prime Meridian divided the globe into two parts, then when used in this application, hemi must mean "half." Good guess! Luke, while older than the target audience, found the Latin ones helpful as a cross-reference with Spanish. He was able to deduce that amor is the Latin word for "love" because he already knew amar is the verb "to love." Conversely, he was impressed that knowing the Latin root dorm ("to sleep") helped him translate a sentence on his test that referred to a bedroom (dormitorio). He used the same root again later that same day in biology - a dormant plant or creature is one that is at rest. He is trying to memorize both sets of roots to help him with his fast-approaching SATs. He knows that there is no way for him to be able to memorize an entire dictionary of words -- but even knowing dict means "word" in Latin helps him deduce that a dictionary is about words. He can then use context to decode: "The teacher orally dictated the notes to the students," means "She said words out loud while the students wrote." He now understands chron means "time", so something in chronological order is organized according to date; a chronometer is literally a "time measurer" -- in other words, a type of watch. He is studying a few roots each week in order to expand his vocabulary base. His plans are to just memorize and drill until he knows them all. These cards are part of Lonestar Learning's Get the Picture series. At $39.99 for a set of 60 cards, I think they can be a great asset for both a homeschool family and a traditional classroom. Celia found the visual differences between homonym (same written name and sound), homophone (same sound but spelled differently) and homograph (written the same) really helped her to differentiate between the three, and said she wished Mrs. M. had these at school, too. (If we can't find the bag with the cards, I'll know where to start searching.) They are oversized, making visual learning easy, and very sturdy. The Greek cards have a green border, while the Latin edges are purple, making it easy to split the group to study one set, OR to tell at a glance which language the word's base is. They will definitely hold up to moderate home use. Although Lone Star Learning does sell vinyl protection pockets, I would consider laminating them if they were going to be used in a school student activity center, co-op, or other high-use situation. 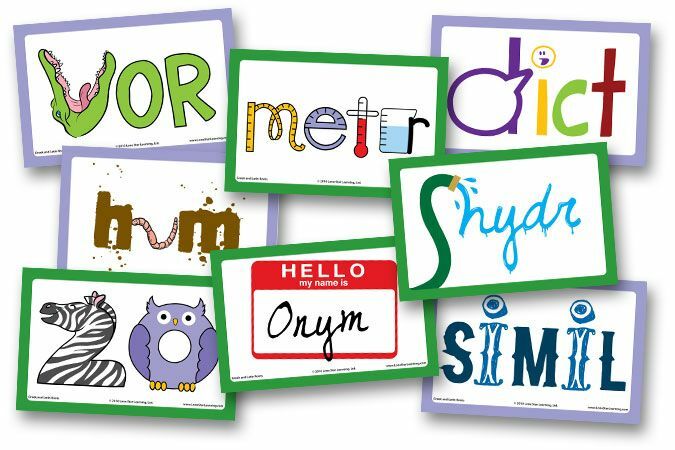 They also have some other great vocabulary sets that I am going to consider purchasing (I have my eye on the science vocabulary set other crew members have reviewed), but we are definitely going to continue to use these for decoding practice. We reviewed the Greek and Latin Root cards, but other crew members used some of Lone Star Learning's other programs. Click the banner to see what they have been studying! Great review! I'm glad Celia found them so helpful. We made the same microscope combination, but I'll have to try more combining the next time we use the cards.